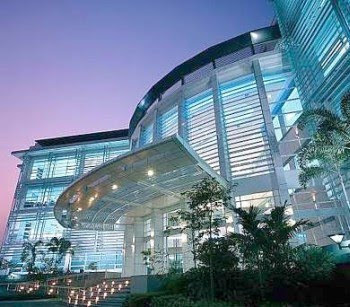 Quill Building 3 is one of the commercial buildings owned by Quill Capita Trust, CapitaLand’s listed entity in Malaysia. SINGAPORE-BASED CapitaLand Ltd is looking to expand its presence in Malaysia’s real estate sector with the strong turnaround of the country’s economy at an expected gross domestic product of at least 6.5% this year. According to CapitaLand Commercial Ltd vice president of marketing Catherine Yao, the company maintains a long-term view of Malaysia’s property market and is committed to being a long-term real estate player in the country. “CapitaLand is one of the largest foreign real estate players in Malaysia today. It believes the market holds good potential and is actively looking for suitable sites to undertake more residential and commercial projects where appropriate,” she tells StarBizWeek. To expand in the country, it will tap on its strengths in the residential, office, shopping mall and service residence business. Besides Kuala Lumpur, which the company has quite a large presence, CapitaLand is also looking at other parts of the Klang Valley and strong growth markets like Penang. Yao says projects will be planned according to market needs and opportunities for best returns for CapitaLand. “Generally, the fundamentals of Malaysia’s property market are still good and we expect sustainable demand for residential properties by both owner occupiers and investment buyers,” she adds. Meanwhile, the country’s Economic Transformation Programme to pave the way for Malaysia to become a high-income nation by 2020 will open up more growth opportunities for a broad spectrum of the economy, including the property industry. In Kuala Lumpur, CapitaLand has undertaken a number of high-end residential projects in city centre, Bangsar, KL Sentral and Mont’Kiara. These projects include Suasana Sentral, Marc Service Residence, Kiaraville, Hampshire Residences, Seni Mont Kiara and Zehn Bukit Pantai. In the last few years, it has also completed a number of commercial projects, notably in Mont’Kiara and Lot J in KL Sentral. Yao says other than Singapore, Malaysia is the only country where CapitaLand has listed entities – Quill Capita Trust and CapitaMalls Malaysia Trust – through which it has a stable of commercial properties. “In line with CapitaLand’s overall strategy for its REITs, both the listed entities are expected to grow in their asset size,” Yao adds. In the service residence sector, CapitaLand’s service residence business unit, The Ascott Ltd, is also on the lookout for suitable opportunities to grow its presence in Malaysia. Ascott is the largest international service residence owner-operator with close to 1,200 units across nine properties in the country. Sastra U-Thant (artist’s impression) will be launched in November. Yao says CapitaLand’s latest residential project in Kuala Lumpur, Sastra U-Thant, will be launched at the upcoming Star Property Fair which will be held from Nov 19 to 21 at the Kuala Lumpur Convention Centre. The company will assume the role of a joint developer and will exercise its expertise in design and project management to ensure that the quality of the high-end condominium project is delivered. Located on 1.77 acres at Taman U-Thant, a prestigious diplomatic enclave off Kuala Lumpur City Centre, Sastra U-Thant will comprise 126 residences with most units overlooking the swimming pool and landscaped gardens. Located within the enclave of other landed houses and low-density apartments, the project is close to international schools, golf courses, medical centres, shopping malls and supermarkets. 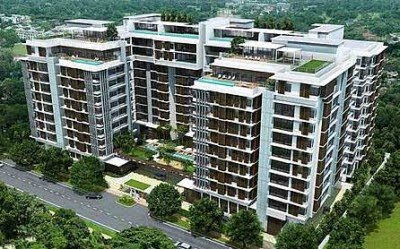 “The condominiums, with built-up from 1,744 sq ft to 5,436 sq ft, will be priced at an average of RM1,000 per sq ft. By pricing it more affordably, we would like our buyers to benefit from capital upside of their property,” Yao adds. The development offers facilities such as jacuzzi, sauna, gymnasium, function hall and lounge. Yao says since the pre-launch registration in August the company has received very encouraging bookings for the residences. Since its inception 15 years ago, Cyberjaya has come a long way to become the country’s premier information, communications and technology (ICT) hub, with the Emkay Group being one of the initiative’s key drivers from Day One. The group, which has contributed in fulfilling Cyberjaya’s needs for office space, commercial and residential units — is here to stay and play a firmer role, its senior executive said. Spearheaded by its founder and group executive chairman Tan Sri Mustapha Kamal Abu Bakar, the privately-held Emkay group is one of the property players that believes in the development of Cyberjaya and will continue to consolidate its position in the country’s ICT heartland. Emkay Group senior general manager Jayasangaran Dhanapal said the group had to date invested close to RM1 billion on various projects there with a net lettable area spanning over 1.1 million sq ft that was fully snapped up by government ministries and multinational corporations. Cyberjaya is now home to more than 1,200 civil servants, who had moved from space-strapped Putrajaya. As at June 2010, it is now the home ground to a daylight population of more than 42,000 people from 26,000 in 2006. Cyberjaya is also a workplace for 19,000 workers spread across 50 MSC Malaysia status-compliant buildings spanning 5.8 million sq ft operated by the likes of HSBC, DHL, Shell, Motorola, Ericsson, Satyam, Dell and many more. Out of the 42,000 people, some 40 per cent are students from the Lim Kok Wing University, Multimedia University and the Cyberjaya University of Medical Sciences. “We will continue to make available another two million sq ft at our MKN Techzone project under Phase 2 by 2014. “We are now in talks with various government ministries, local and foreign multinational corporations which are keen to take up the additional area. MKN Techzone in Cyberjaya is the place to be in,” Jayasangaran told Business Times in Cyberjaya recently. What makes MKN Techzone in Cyberjaya tick? Jayasangaran said MKN Techzone continues to be the location of choice due to its close proximity to the Putrajaya administrative centre of about 2km through the Putrajaya link. There are plans by master developer of Cyberjaya, Setia Haruman Sdn Bhd, to have additional access to the Maju Expressway that will directly connect to Kuala Lumpur City Centre. The highway has markedly reduced travel time to only 20 minutes to Cyberjaya. The proposed new link will further enhance the accessibility to MKN Techzone, a project launched by Emkay in December 2006. MKN Techzone also hosts various facilities such as cafetaria with a seating capacity of 250 at one time, 6 stalls, a day care centre which can house about 60 babies, MAMPU and Jabatan Perkhidmatan Awam. It also has a dedicated RM26 million multi-level carpark with more than 1,000 surface and basement carparks. It will also build five blocks of hostels with more than 3,000 beds. Construction is due to start by the end of the year. A cluster of 100,000 sq ft of retail development is also in the pipeline for development in MKN Techzone. “Having experience in building office spaces and handling the requirements, processes and documentation of various government departments and multinational companies, we are now more than ready to welcome them,” said Jayasangaran. The Emkay Group is now poised to be the specialist in office building development, he added. EXUBERANCE is often an indicator of an unsustainable pattern, be it for equities, collectibles or real estate. A rumbustious atmosphere in any asset class, more often than not, eventually leads to a deflation, which can be painful to swallow for its participants. The two asset classes that have seen their fair share of bubbles are stocks and property, fuelled by euphoric expectations of higher profits and easy credit. The banking sector has always been in the forefront of such situations. Prior to the 1997/98 financial crisis, banks had lent most of their money to businesses while a lot of cash was also diverted for the purchase of shares. Then, household debt was much lower as a percentage to gross domestic product (GDP) than it is today and residential loans accounted for about 16% of total loans. When the economy crumbled during the crisis more than a decade ago, the banks were severely hurt, not just in Malaysia but throughout much of South-East Asia and other countries that saw their currencies attacked and a spooky flight of capital. Many banks in Malaysia had to be recapitalised and that was the catalyst to the consolidation of the banking sector that today, has resulted in the creation of nine anchor banks in the country. Learning from the causes of troubles back then, companies shifted their funding needs to the debt capital market, which defrayed the risks and funding needs of corporations away from banks. That transition by all accounts has been a success. Malaysia’s debt capital market is one of the most robust in Asia but the migration of corporations meant banks had to look for a new source of business. Financial institutions then steered their sights to the household sector, which was prime for more credit as debt levels within homes were low as a percentage of GDP. As it stands today, household debt has grown by leaps and bounds. As a percentage of GDP, it was 40% in 2000 and that has grown by more than 50% to around 65% today. Much of the credit demand has come by way of providing financing for the purchase of cars and of late, a surge in giving money to people for consumption needs. But the lions’ share of that funding constitutes home loans, largely owing to low interest rates and a steady rise in income levels. “Interest rates have fallen and that has attracted people to borrow more,’’ said ECM Libra head of research Bernard Ching. Housing loans are also seen as a safer bet for banks as traditionally, the non-performing loans for houses are low. Margins for housing loans are not the best for banks as competition in the segment means that most financing packages out there today charge rates that are below the base lending rate. Analysts say banks can afford to take a margin hit as funding for such loans, and for all loans in general today, comes from their own deposits where the cost of funds are the lowest. Banks are awash with cash as, on average, the loans-to-deposit ratio is around 80% for the industry compared with above 100% during the financial crisis. Also, lending towards the residential sector is a way of diversifying risk. Business loans tend to be lumpy and riskier. Analysts say for the same amount of money, banks would lend to a single large business and they can carve that out into smaller slices and lend to multiple borrowers in the housing market. The main difference is the amount banks lend to the value of collateral they get. As property prices in Malaysia tend to rise over time, so would the collateral, usually the home itself. As interest rates remain low and competition in the housing loan segment has become a cut-throat war for many banks, real estate loan packages have also morphed. In the past, larger downpayments were needed from homebuyers to purchase houses and the tenures were extended to 25 or 30 years. Today, reports indicate that some properties, depending on the customer, can be fully funded by a bank loan and the amount of downpayment in general can be as low as 5% or 10%. The tenures are also elongated, up to a borrowers’ age of 60 years. Also to help households afford homes, the minimum threshold for monthly payments have increased beyond the historical norm of 30% limit. Analysts say this is possible as long as income rises and interest rates remain low. That risk would, however, compound should the interest rate environment flip in the future. Mortgage broker Chew Thiam Hock says the low interest rate environment is enticing more people, even those who can afford to pay, to the banks for a higher loan amount. “In the past, people did not want a high margin of financing but with interest rates so low, they have no problem taking a 90% loan,’’ he says. The growth of the housing loan industry has also created business opportunities for brokers like Chew who have astute knowledge on the credit appetite of the panel of banks they represent. Are banks taking too much risk? With residential loans now accounting for 27% of all loans for banks, the question is are banks are over exposing themselves to housing loans? Defining a housing bubble is not easy. Prices of property do experience periods of swift rises but the general understanding of a property asset bubble is when the price increase is too rapid devoid of fundamentals. Some basic indicators include income levels, jobless data, rentals against the cost of a property or even affordability ratios can be used to gauge whether a bubble is forming. “The risks are essentially the same for the banking sector, whether it’s corporate or housing loans, as consumer loans are a large part of the total banking sector loan,’’ says an economist. But based on the example of Hong Kong market, one analyst disagrees. Sunil Garg, a banking analyst at JPMorgan Securities, says the housing loan represents one of the safest segments for banks. With housing loans by banks in Hong Kong accounting for roughly 40% of their loan books, one would think they would have suffered badly when the property market tanked during the 2008 global financial crisis. However, property prices have since, not only rebounded off their lows, but have scaled new heights, and the loan-to-value ratio in banks means those assets are in a healthier state than before. Still, the threat of a housing bubble and its far reaching impact can be damaging to any economy. The repercussions are only too well documented world over. “We need to make sure we do not put our guard down against such risks,’’ says the economist. One worry surrounding the property market is that building activity tends to ratchet up to take advantage of a boom in prices. As it stands now, the anecdotal evidence points to a surge in the building of high-end properties. For developers, this segment represents the cream of their business as margins are always the fattest. 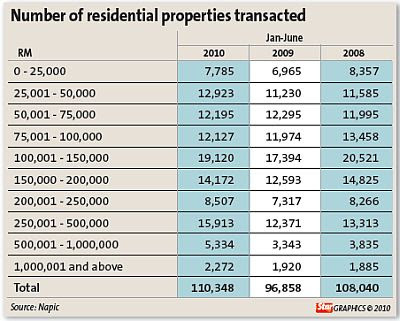 According to National Property Information Centre, the ratio of unsold units in the property sector is rising. While those percentages in Kuala Lumpur and Selangor, where concerns that prices are rising way too fast, are below the national averages, it is nonetheless rising. With that, analysts say banks are becoming cautious over their lending patterns as internally, they are scrutinising loans with a fine tooth comb. “Banks might have their own assessment on the value of properties and the intrinsic value, which is the force sale price of a house,’’ says the analyst. One proposed measure involving the loan-to-value ratio has generated significant debate. Still, it is widely perceived that genuine homebuyers would not be penalised with having to fork out a large downpayment. Those who could be penalised are the third or so on home buyers who will have to come up with 20% or more of the cost of the house. “It’s a paradox for banks. When loans growth is strong, people will say banks are contributing to speculative activity and the bubble. When they are conservative, people will say banks are not supportive,’’ says a banking analyst. As developers make a beeline to build costlier homes in the hot markets in the country, more people are feeling they cannot afford to buy homes these days. With workers’ salaries no where close to keeping pace with asset inflation or even the cost of living in the country, the issue of social justice – where every Malaysian should be able to afford a home for themselves – has cropped up. “There is always a need for affordable housing, so prices remains within the reach of people. You don’t want the banking system to allocate too much money for speculative home-buying purposes,’’ said an economist. Analysts say banks already have a social obligation to provide a certain amount of financing for the purchase of low-cost housing. “Banks have a quota. If they don’t meet that, they will be penalised,’’ says an analyst. As property prices rise, financing packages too tend to evolve alongside. In the past, the minimum downpayment for housing loans used to be much higher than today largely because housing was much more affordable back then. For banks, the business of home lending has long been viewed as a safe bet. Houses have sound collateral value as they tend to appreciate over time; the downpayments paid for those houses when loans are disbursed act as a buffer for many banks. The numbers speak for themselves. Most banks, especially those with a strong retail banking orientation, see property loans as an important part of their loan portfolio. 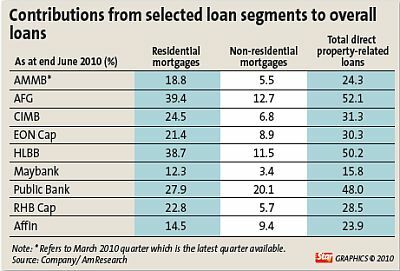 As at end-June 2010, property loans accounted for 37% of the total banking sector loan portfolio. This is from an estimated 17.5% level in the beginning of 1997. However, some banks such as Public Bank Bhd (PBB), Hong Leong Bank Bhd (HLB) and Alliance Financial Group Bhd (AFG) have a much higher exposure to the property sector, with property loans accounting for about half of their total loan portfolio. Within the property loans segment, residential property loans remain the main focus for the banks as a result of the perceived low risk of the residential property segment. As at end-June 2010, residential property loans accounted for a significant 73% of property loans and 27% of gross loans in the banking sector (versus 12% as at the beginning of 1997). When it comes to the individual listed local banking groups, this composition can vary from 12% to close to 40%. AFG has the highest exposure to residential property loans with 39.4% of its total loans book, HLB with 38.7%, PBB 27.9% and CIMB Group Holdings Bhd 24.5%. Banks with a strong retail banking orientation are observed to have home loans making up 30% to 40% of their loan portfolios on average. MIDF Research banking analyst Kelvin Ong believes the larger capitalised banks such as PBB, CIMB and Malayan Banking Bhd (Maybank) are market leaders in terms of housing loans as they have the advantage of better distribution channels such as stronger sales force, marketing network as well as more branches for greater penetration and customer service. “These banks also have a wider network of solicitors and real estate agents. Another reason is their stronger retail deposits such as current account savings account which provide a low cost of deposits to support a lower credit cost,” he says. 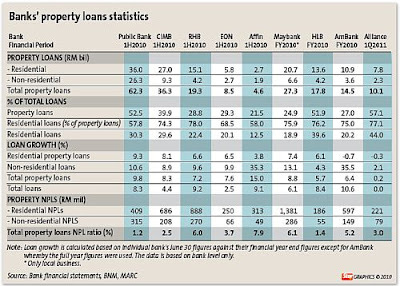 According to Ong, PBB leads with a 17% share of the mortgage loans market, followed by CIMB with 13.8% and Maybank 13.4% as at June 30, 2010. Ong says the key focus of banks will be to finance properties developed by reputable developers with good track record and properties in good locations. “They will also have to closely monitor properties located in areas which are already highly priced (showing signs of a property bubble) to avoid over financing,” he says. Malaysian Rating Corp Bhd (MARC) vice-president and head of financial institution ratings Anandakumar Jegarasasingam says residential property loans are generally considered low risk for banks. This is because most borrowers will strive to service their loan commitments, especially for their primary residence, due to the economic utility of the residential dwelling and the “social stigma” associated with a loan default and the subsequent auction exercise, he says. “Even in the event a residential property is put to auction, the recoverable collateral value is likely to be sufficient to ensure a full loan recovery as long as there isn’t a major property price correction. “While most banks have been prudent in ensuring that the market and forced sale value of a property is appropriately appraised at the time of loan sanction, recent anecdotal evidence suggests that intense competition has resulted in some relaxation of credit underwriting standards,” he adds. Anandakumar says in general, non-performing loan (NPL) ratio for residential property loans of local banks has been more or less on par with NPL ratio for their broader loan portfolio while the NPL ratio for non-residential property loans has been lower than the gross NPL ratio. 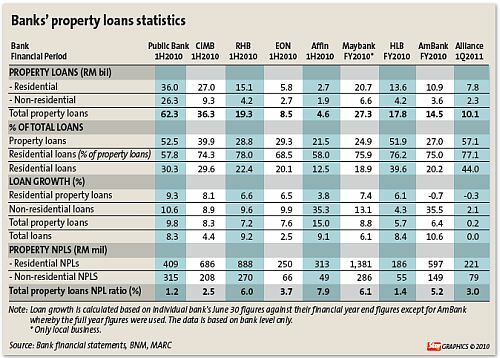 According to MARC, PBB has the best residential property loans NPL ratio of 1.1% while Affin has the highest at 11.7% (based on data at bank level). RAM Ratings head of financial institution ratings Promod Dass says the home loan market is very competitive and successful banks are the ones that have been able to act nimbly to meet customer demands both in terms of pricing and range of product offerings. “In general, banks’ lending criteria and standards have remained prudent. “Banks also look at various aspects of the property being funded such as market valuation, location, developer, price and property type in their underwriting process as part of the loan-to-value (LTV) determination,” he says. However, he notes that more residential mortgages had LTVs of 90% or more for the past few years. “Putting things in perspective, LTVs are only one part of the loan approval process. A borrower’s capacity to service his or her home loan is a key determinant that banks analyse,” he says. Promod says among other steps, banks also examine the Central Credit Reference Information System (CCRIS) records to determine the number and quantum of other loans that the borrower has as well as the payment track record. CCRIS is a key decision-making tool when it comes to retail loans. Anandakumar does not foresee the demand for residential property loans to be significantly impacted by the proposal to reduce the LTV ratio to as low as 70% for third and subsequent house purchases. “Any individual who is purchasing a third residential property is either likely to be sufficiently affluent or a reasonably savvy property speculator. “In either case, a 10% to 30% reduction in the LTV ratio is not sufficient to deter a potential purchase,” he says. A more effective way to control an unhealthy appreciation in property prices would be to reduce the expectation of potential gains that triggers speculation, he adds. “This could be done via the implementation of a robust property gains tax that can, if appropriately structured, reduce the incentive to speculate,” he says. TA Securities says while the proposal should not have any impact on first-time home buyers, it could curb speculation and dampen loans growth. 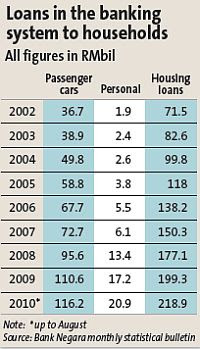 “Assuming residential loans fall by 10% in 2011, this could lower our 2011 loans growth assumption to 10.6% from 13.6%. “We also estimate that a 10% decline in mortgages should shave some 8% off our average financial year 2011 net profit forecast for banks under our coverage,” it notes. TA Securities believes AFG will be the hardest hit due to a large proportion of loans in residential mortgages. Its exposure to the residential mortgage segment represents some 39.4% of its loan book. NATIONAL mortgage corporation Cagamas Bhd has provided over RM240bil in liquidity to the banking sector for on-lending to the mortgage market since its establishment in 1986. According to president and chief executive officer Steven Choy, Cagamas stands ready to purchase housing loans from financial institutions that meet its eligibility criteria. “We will continue to provide mortgage lenders with liquidity and capital management solutions. “We expect our business to grow in line with the growth of the banking and property sectors as we continue to play our role as a secondary mortgage institution,” he says. Cagamas plays its role in growing the property loans market by purchasing mortgage loans from financial institutions, thus providing liquidity and/or releasing capital for the financial institutions to on-lend to the property loan market. This enables financial institutions to increase their profits by utilising the funds obtained to grant further housing loans or other loans. Cagamas funds its purchases of loans and debts primarily through the issuance of Cagamas debt securities. Financial institutions have a ready access to liquidity as long as they have the eligible assets to sell to the company. Cagamas also allows financial institutions to tap the capital market, rather than through its deposit base, for long-term funding requirements, with an element of hedging. “In most instances, we are able to provide an element of cost savings which can be passed on to homebuyers,” Choy says. This will provide homebuyers accessible and affordable mortgage financing. Choy views the local property loan market as a significant one, accounting for some 27% of total loans in the banking system. “It is also highly competitive. “We expect the property loans market to grow with an increasing population – from 28 billion in 2009 to almost 30 billion by 2015 – and the expected doubling of per capita income from US$6,760 to US$12,139 over the next three to five years,” he says. Choy says based on Bank Negara statistics, the quality of property loans have improved in tandem with the non-perfoming loan ratio which stands at 1.3% as at December 2009 compared with 9% at the height of the 1997/98 financial crisis. “We believe this is a result of prudent lending by the financial institutions combined with efforts by Bank Negara to improve risk management across the banking industry,” he says. Choy sees access to affordable financing for mortgages and affordable quality properties as important ingredients to boost the property market further. “Financial Institutions and developers need to continue to work closely to offer attractive and affordable financing packages to homebuyers,” he says. Choy adds that the Government has implemented several initiatives to promote the property market such as stamp duty exemptions for selected properties, access to funds in the Employees Provident Fund for mortgage repayment and real-property gains tax exemptions, among others. In addition, Cagamas’ mortgage guarantee programme can provide accessibility to affordable financing for homebuyers, particularly to first-time homebuyers who have just entered the workforce. “These homebuyers tend to have repayment capabilities but not the savings required for a downpayment for a property. “For this segment of homebuyers, the mortgage guarantee programme can give them access to higher margin of financing without putting pressure on the banking system to lower the loan-to-value ratio,” he explains. On the other hand, for homebuyers with savings for deposit, the programme will allow them to upgrade their property, he adds. “In both instances, it can add volume and value to the property market,” Choy says. Cagamas has also evolved and diversified its business model from that of a national mortgage corporation seeking to aid Malaysians with affordable housing into a leader in securitisation. The Cagamas model is well regarded by the World Bank as a successful secondary mortgage liquidity facility. Cagamas is the leading issuer of AAA debt securities as well as one of the top sukuk issuers in the world. Since its incorporation, Cagamas has cumulatively issued RM245.13bil of conventional and Islamic debt securities. Cagamas’ debt securities continue to be assigned the highest ratings of AAA and P1 by RAM Rating Services Bhd and AAA/AAAID and MARC-1/MARC-1ID by Malaysian Rating Corp Bhd, denoting its strong credit quality. If numbers were to tell a story, the numbers provided by the National Property Information Centre (Napic) is very telling. Between January and March of last year, about 750 units of residential units costing slightly more than RM1mil and above exchanged hands. For the first three months of this year, a total of 1,168 units in the same pricing category were sold. That is an increase by more than half in a short span of a year. With the exception of housing categories between the RM50,000 and RM100,000 range, the six categories between RM100,001 and RM1mil showed an increase in the number of transactions. Lim Eng Chong, a valuer with property consultancy Henry Butcher, says there are several ways of looking at these rise in transactions. The first is that Malaysians have become richer and are upgrading to better housing. The second is that housing has become more expensive. “The confidence level for the latter part of 2008 and early part of 2009 was low. By the end of 2009 and early part of 2010, most economies have turned around and people were willing to put money down on big-ticket items. “Developers were also more confident and there were more launches. Obviously, income levels have also increased,” says Lim. It is this strong purchasing power, says RAM Holdings Bhd chief economist Dr Yeah Kim Leng, which has enabled Malaysians to snap up properties as an investment asset. Other supporting factors were low interest and easy credit. A source from Malayan Banking Bhd says the bank’s mortgage department in one of its Petaling Jaya branches has seen the average amount of housing loans applied for on the increase. A few years ago, the amount of housing loans at one time were predominantly in the RM100,000 and RM200,000 range. Today, the minimum amount applied for is about RM300,000. While this trend is not happening across all Maybank branches, to a certain degree, it is an indication that borrowers are increasing their household debt by applying for bigger loans. “There was a time a few years ago when we have customers applying for loans of RM200,000 and below. “We don’t see so much of that today. We are seeing applications for RM400,000 and above, because property prices are increasing,” she says, adding that many of the loans in this category are not even for high-end properties. She defines high-end housing as those priced at RM2mil and above. “However, my research indicates that it is not the only, or even dominant force, in the United States. Other forms of easy credit such as low equity downpayment requirements, extension of credit to very risky borrowers who should be renters, not owners, and the like, probably play an important role. “We are just engaging in research on this in the United States, and do not yet have the answers. I view it as a necessary but not a sufficient condition for a pricing bubble to develop.” he says. Gyourko says most Asian markets are heavily influenced by China, both indirectly from growth in its huge economy and (in some cases such as Singapore and Hong Kong) capital flows from China into local housing markets. “Whatever you think is going to happen to China pretty much tells you what is going to happen in these other markets. I suspect they will be highly correlated,” he says. He predicts prices in Hong Kong, China and Singaproe will take a hit in the next one to three years. Both China and Singapore have introduced various measures to cool their property market. In September 2009, the Singapore government tried to coll speculation by abolishing developers’ interest absorption schemes, and followed that with two additional rounds of measures in February and August this year to make it increasingly expensive for speculators to flip properties. “(The Singapore government) is sending a clear signal to investors that it is going to stop the price boom. The fact that it is doing the third round is a signal that it is going to do whatever it takes,” says Gyourko. There have been talks in Malaysia that Bank Negara may introduce similar measures. Gyourko says there must be a political will to deflate bubbles, if there is one. Gyourko, who has been studying China’s property market and been privy to Singapore’s, says shifting a lot of money into property purchases is not permanent or sustainable. Over-leveraged property buyers may be in danger of defaulting on their loans and that will send property prices down, he says. A source from a property developer says the real problem is banks extending loans to 65 or 70 years old. “At 40, one is still able to take a 30-year loan. That is the real issue here. At the end of the day, housing is about affordability. A source from a property developer says he hopes Malaysia will not become a rent culture similar to Britain. There, young people could not afford to buy their own homes because prices have been driven up so high. The foreigners have bought so much into the British market and whacked up the prices that the locals cannot afford to buy but have to rent. Property prices are rising throughout Asia and concerns are growing that a property bubble would have dire consequences on the banking sector and overall economies of countries in the region. From India to Shanghai, and from Hong Kong to Singapore, prices are red hot. While economic growth, modernisation and urban migration is creating huge demand for residential properties, much of that is also due to money seeking higher returns in a low interest rate environment. The leverage being taken on by households to purchase what many would say is the primal urge to own a home is growing in a number of countries but like all bubbles in history, there is a point to its elasticity. StarBizWeek take a brief look at how some of the asset bubbles have affected some countries in the past and what are the current problems in the property sector. The most extreme example of a stock market and real estate bubble in recent times has to be Japan. During the 1980s, the Nikkei 225, which is the benchmark stock market indicator for the Japanese stock market, surged to a height of over 38,957 in December 1989. Its peak this century was 18,300 points and the index has been hovering around the 9,400-point level this week. The consequence of the collapse of the Japanese stock market then was also felt in the Japanese property market, as both ran-up hand in hand during a time when exuberance was fuelled by low domestic interest rates and expectations of a “can’t lose” economic environment. The bursting of the asset bubble in Japan led to what is now known as the lost decade. Banks, which were also flushed with cash because of the high savings rate of the Japanese, lent heavily for speculative purposes in the securities and properties industry and were bailed-out by the government when asset prices deflated. In fact, the price of properties in Japan on average has not recovered anywhere close to what those properties were priced when the market started to unravel in 1990. The United States is no stranger to real estate booms and busts. In fact, those cycles tend to happen from state to state during different periods of time. But the grand daddy of all boom and bust cycles took place between 2000 and 2005 when property prices surge beyond any fundamental justification. The rising prices of property meant that banks started to seek more and more marginal quality buyers, which we all know today as subprime borrowers. Those people with poorer credit history had financial deals that were above the odds compared with what the prime borrowers were dishing out for their real estate loans. The lucrative real estate loan segment also saw the entry of non-banks that started lending money and packaging those subprime debt into collateralised debt obligations. When property prices headed south, so did the repayment capability of those subprime homeowners. The collapse of the US housing market resulted in a global recession brought about by troubles banks that had to deal with a mountain of bad debt triggered by the housing market. In the world’s second-largest economy and most populous country, a housing boom has truly been in the works for some time now. There have been intermittent corrections but the massive stimulus package by China’s government and the subsequent pick-up in economic and investment activity has resulted in skyrocketing prices once again. Earlier in the week, China watcher and economist Andy Xie said the property market in China has peaked and is set for a 5-year bear market. Those who disagree say Xie’s comment does not take into account the measures taken by the authorities to cool the market and the high downpayments that are needed for property investments. The general believe is that a boom in real estate in China has now morphed into a bubble. When the bubble ends, the scale in the number of properties being built and the build up in prices could not only have a serious impact on the country but for the rest of Asia and the world. For city states like Hong Kong and Singapore, which are built on financial services, the marriage between money and property has been a symbiotic relationship that is uncommon in many other parts of Asia. In Hong Kong, the percentage of a person’s pay packet that is used to pay for their mortgages are larger than what Malaysians are used to. But a combination of next-to-nothing interest rates, a booming economy, purchasers from foreigners especially mainland Chinese in Hong Kong have seen property prices in Hong Kong and Singapore not only recover from the bottoms reached during the 2008 global financial crisis but surged to new record highs. The governments there are naturally worried. In fact, Hong Kong and Singapore have instituted curbs to cool down the deluge of money that is headed towards the property sector. Their hope is that it should put the brakes on the property train in those countries but with people quite used to peaks and troughs in the price of property, the hope is that this bubble would not have a devastating impact on the large banking sectors of those jurisdictions. COMB through any newspaper these days and chances are you will most certainly stumble upon advertisements on property loans touting attractive terms and conditions. It’s a highly competitive landscape out there. Apart from competing among themselves for a piece of the mortgage pie, banks also have to contend with insurance companies which offer pretty appealing terms as well. OCBC Bank (M) Bhd head of secured lending Thoo Mee Ling sees competition as a way of life in the property loans business. “Intense competition, especially in pricing, has almost become the nature of the mortgage business. “However, OCBC’s strategy has always been to keep close tabs on customers’ needs and not only meet but exceed their expectations as well as by going the extra mile,” Thoo says. Currently, the discount on base lending rates for housing loans range from 1.8% to 2.2% in the market. Thoo says property loans will continue to have a significant influence on the bank’s net profit. Despite the intense competition, HSBC Bank Malaysia Bhd general manager (personal financial services) Lim Eng Seong says the bank is comfortable with the size of its property loans book. Lim believes HSBC’s strong product and service proposition via a flexible mortgage will be a key differentiating factor to grow the business further. “Our flexible loan allows customers to make extra payments to reduce interest payments and shorten the loan tenure. Should an urgent need arise, customers may redraw the excess payments made,” he says. HSBC offers home loans for a minimum of five years to a maximum of 35 years where margin of financing can go up to 95% of the property’s market value. To ING Insurance Bhd chief operating officer Isold Heemstra, residential property mortgage is a way to diversify investment income for insurance companies. “It helps to mitigate market volatility and provides a stable income stream to insurance companies that demand long-term cashflows,” he says. However, ING’s mortgage portfolio shrank last year as borrowers went for floating rate products due to the lower overnight policy rate. Insurance companies offer fixed-rate residential mortgages. Heemstra admits that competition in the property loans business has always been intense. “We differentiate ourselves by providing a mortgage business total solution that comes with fixed-rate home loan with house owner and life insurance protection. “ING also provides protection to the valuables and contents in one’s household against loss or damage on selective perils,” he says. ING provides financing for residential properties only with a maximum loan amount of 90% and up to 30 years loan tenure. ING now offers a fixed interest rate of 4.85% per annum (customer pays all closing fees) and 5.25% per annum (ING pays all closing fees). American International Assurance Bhd (AIA) chief executive officer Khor Hock Seng says the company has experienced positive loans growth since 2005 although last year was challenging. Its property loans portfolio are mostly made up of fixed-rate residential mortgages with margin of financing of below 80%. Khor says the company will continue to work with its agency force and business channels to grow the property loans business. “We will also offer various packages to meet the needs of our clients,” he says. AIA’s residential mortgages has a fixed rate of 4.99% per annum (non-zero moving cost) and 5.25% per annum for zero moving cost. The margin of financing is up to 90% for a maximum tenure of 30 years. The Greater Kuala Lumpur (GKL) plan is a good start to lay the foundation towards raising the bar of livability for the capital city and its surrounding conurbations to become a world-class global city. The GKL is a noble and ambitious plan that, if planned and executed properly, will be a boon to the overall quality of life for the people besides the significant spillover benefits to the country’s economy. The 279,327ha GKL will cover districts under 10 municipalities, namely Kuala Lumpur, Putrajaya, Selayang, Ampang Jaya, Petaling Jaya, Subang Jaya, Shah Alam, Klang, Kajang and Sepang. Under the plan, GKL will be a sprawling livable city and economic hub with more open space, improved waterfronts and superior public transportation system, possibly with underground trains. The overall plan is to expand the city into clusters outside the capital city of Kuala Lumpur through better improved infrastructure and public transport system, including light rail transit (LRT) and mass rail transit (MRT) lines. Other proposals include establishing an international financial district near Bukit Bintang and the re-development of the Sungai Besi air base and the Sungai Buloh Rubber Research Institute (RRI) land. For such a grandiose and ambitious plan to work, it is mandatory to have a well thought-out and thoroughly-researched master plan that takes into consideration all the important attributes and characteristics of the shape and type of global city that GKL aims to become. Cities need to be constantly renewed and have to uphold multiple roles to keep up with the changing needs and demands of the present and future generations. This is a golden opportunity for all stakeholders, that include the public, consumer groups, the planning and approving authorities, and industry groups, to come together to work towards an iconic master plan that is economically, socially, culturally and environmentally sustainable and viable. While the spinoffs in terms of wealth creation are expected to be extensive, maximising profit should not be the priority. Contrary to the common believe that only the big, tangible projects should be given greater attention, equally important are the basic attributes and non-tangible items that can be counted upon to make the difference between success and failure of such a major plan. Instead of being bogged down by just the “hardwares” such as the big projects, due attention should also be paid to elements that constitute the heart and soul of our city which in effect makes up its unique identity. The city needs to be well-planned with components for work, play and relax. There should be a balance between development and other softer attributes, which include a wholesome and holistic living environment, a lively local arts and cultural scene, museums, art galleries and libraries, among other things. It is also important to have well thought-out plans to ensure amenities for physically-challenged people, the elderly and infirmed, children and expecting women, are in place. To attain the status of a global city, an “overhaul” is needed to lift the service and maintenance culture among Malaysians. A high level of service among the frontliners, including the immigration officials, cab drivers, hotel personnel, and waiters and waitresses, will paint a good image for the country among visitors. Likewise, a good maintenance culture will ensure that at every level of the society – from the public to the private sector and the local authorities – will play an active role to ensure all the facilities will be kept in tip-top working order. Many people will agree that an overhaul and upgrading of the public transportation system is long overdue. Diligent effort has to be expended to ensure the ambition of building up a comprehensive and integrated transportation and connectivity plan to synchronise the LRT and proposed MRT network will work well with the other modes of transport, including the taxi and bus networks. Meanwhile, land has become a scarce resource in the city’s development process and this has contributed to the escalating cost of land and rising property prices. The proposed redevelopment of the 160ha Sungei Besi airport and the 1,320ha RRI land in Sungei Buloh should help to ease the land-scarcity problem. Having the opportunity to developing these large parcels of land will enable better integration of services, infrastructure and other components that are more long term and sustainable. It deserves careful and conscious planning that incorporate world-class standards to become a showcase of development for the country. ·Deputy news editor Angie Ng hopes the Greater Kuala Lumpur plan will have all the right attributes to improve the overall quality of life of the people.